THANK YOU for helping us release the Windows 10 Anniversary Update to our customers last week! We couldn’t have done it without you. 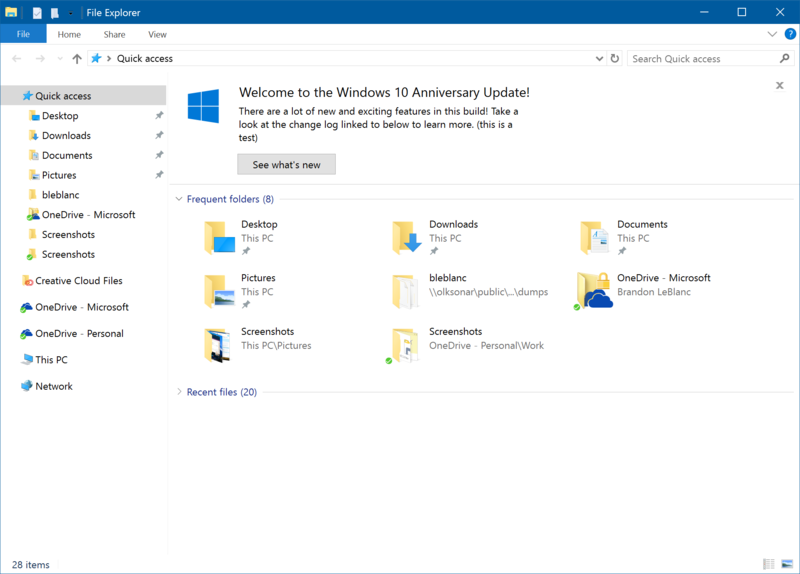 Now that the Windows 10 Anniversary Update (Build 14393) has been released to our customers, it has replaced the Windows 10 November Update (Build 10586) in the Current Branch. We’re now ready to start releasing new builds from our Development Branch again. Today we are releasing Windows 10 Insider Preview Build 14901 for PC to Windows Insiders in the Fast ring. NOTE: It may take a couple of hours for this build to show up for some Windows Insiders as updated device targeting needs to roll out. I know a lot of Insiders are wondering about Mobile. Just like we did after the release of the Windows 10 November Update – we are starting off by releasing PC builds from our Development Branch first and then start releasing Mobile builds a few weeks after. Right now, the team is laser-focused on preparing to release the Windows 10 Anniversary Update to Mobile devices and we think we’re almost ready. You can help us out by making sure you are running Build 14393.67 (KB3176931) on your phone and sending in feedback on any issues you run into via the Feedback Hub. Our team is determined to make sure we release a high quality build to our customers and your feedback really makes a difference. I also recommend reading this post regarding supported Mobile devices for the Windows Insider Program going forward. As the team mentioned in a post in Feedback Hub earlier this week, you won’t see many big noticeable changes or new features just yet in builds we release from our Development Branch. We are focusing on making some structural improvements to OneCore which is the shared “heart” of Windows across PC, tablet, phone, IoT, Hololens and Xbox. We’re doing some code refactoring and other engineering work to make sure OneCore is optimally structured for teams to start checking in new features and improvements in a few months. As a result, these builds may include more bugs and other issues that could be slightly more painful for some people to live with. If this makes you uncomfortable, you can change your ring by going to Settings > Update & security > Windows Insider Program and moving to the Slow or Release Preview rings for more stable builds. I’d also like to thank everyone for all of your help around the research and ideas for the #WINsiders4Good events. The Seattle one was a great success and I will write up a detailed blog (with a video!) once we wrap up Berlin this weekend. The team and I are working on creating a CAT (Create-A-Thon) In A Box so that any of you can host your own event with your local community. I love that our Insider community are people who use the tech they love to help eradicate the problems they don’t love. That’s all for now. We hope you enjoy the build and have a wonderful weekend.